The Inboard Set comes with Speedometer and Pitot, Tachometer, Fuel gauge, Voltmeter, Water Temp gauge and Oil Pressure gauge. 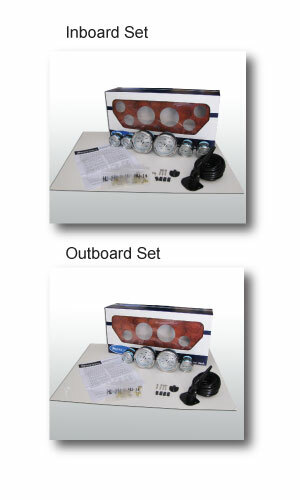 The Outboard Set comes complete with Speedometer and Pitot, Tachometer, Fuel gauge and Voltmeter. Available in Chesapeake White Stainless Steel, Chesapeake Black Stainless Steel, Euro, Euro White, Dress White and Kronos styles . The Digital Dash kit digital gauge set is an easy to use Analog style instrument, with advanced ECU monitoring capabilities demanded by today's leading engine manufacturers. The digital instrumentation communicates directly with the NMEA 2000 and SmartCraft protocols used by the engine ECU providing an important link between the operator and the engine ECU. With just a push of a button the operator can tell the status of the health of the engine including diagnostic messages, fault alerts, and parameter information. The Digital Dash kit from Faria is a great value for those boat owners looking to upgrade the instruments on their boat with American Made, OEM drop in replacements.